The international career of Ahmed 'Mido' Hossam under Egypt coach Marco Tardelli appears to finally be over. The Pharaohs beat four-time African champions Cameroon 3-2 on Sunday in a vital 2006 World Cup qualifier without the AS Roma striker. Tardelli, who has been irritated by Mido's behaviour since he took charge in March, confirmed that he is no longer interested in having the 21-year-old as part of his team. "He is not on my books," the 1982 World Cup winner told BBC Sport. The highly-rated Mido had actually been named in Egypt's 25-man squad for the Group Three clash in Cairo but was withdrawn after his former French employees Marseille told the Egyptian FA the player is suffering from a groin injury. So many Pharaohs supporters were thus surprised when the tall striker, who signed for AS Roma last week for US$7.3 million, played for his new club in a friendly on Saturday, just 24 hours before the Cameroon tie. As a result, the 35,000 fans who packed the Arab Contractors stadium on Sunday evening made clear their feelings against Mido as they denounced the striker and requested that he never play for the national team again. "I used to like him but now I feel bad when I hear his name," Yasser Ahmed, 18, said as he took a short break from his angry protests against Mido. "He is a spoilt brat and a bad image for his country," 48-year-old engineer Mustafa Hassan told BBC Sport. The Egyptian newspapers highlighted the incident in their match coverage and some of them went as far as describing Mido as a traitor. The AS Roma forward, widely regarded as the bad boy of Egyptian football, has faced harsh criticism from the Egyptian media since the Pharaohs failed to pass the group stage at the 2004 African Cup of Nations. He has regularly been involved in disputes with all his coaches, starting from Ronald Koeman at Dutch side Ajax Amsterdam through to Tardelli in the national team. 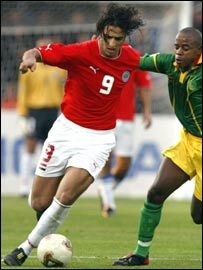 Mido has not featured in one of Egypt's four qualifying matches so far.